Some of my other pulse recipes include, Snickerdoodle Pancakes, Black Bean Burgers, Peanut Butter Cookies and Sweet Potato Chili. I encourage you to take the pulse pledge with me – a ten week commitment to eating pulses (at least once a week) in 2016! My Homemade Sriracha Sauce would take this recipe to the next level of yum! Definitely give it a try! 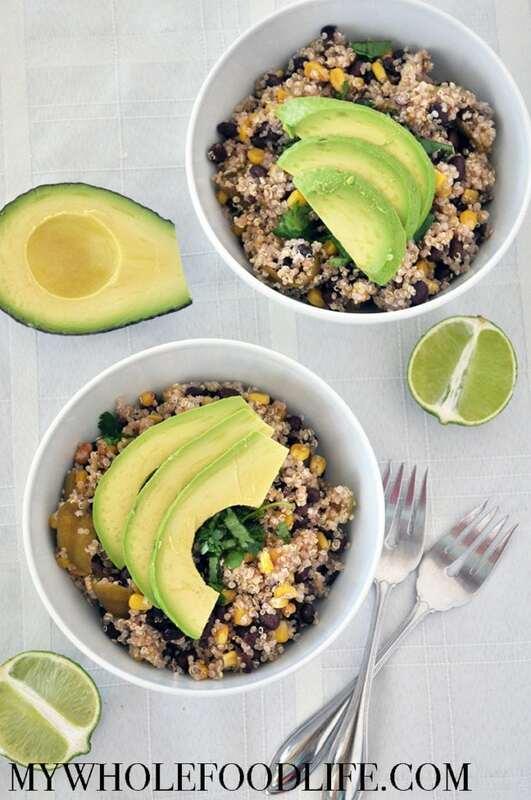 In a bowl, toss the tomatillos and corn in the avocado oil. Spread onto a baking sheet and roast for about 20 minutes. You may need to toss once halfway through. Once the tomatillos are cooled, give them a rough chop. In a small saucepan, add the quinoa and water. Bring to a boil, then turn down, cover and simmer until all the water is absorbed. About 10 minutes. Add everything, except the avocado, to a bowl and mix well. Once ready to serve, chop avocado and serve on top. This should last at least 4-5 days in the fridge. It can also be frozen for longer storage. Enjoy! I have a neighborhood meeting/potluck tomorrow. I was thinking about doing a quinoa salad. I think I will do this instead. Slightly different. Thanks! Making this tonight! Perfect timing to go with veggie fajitas! I can't get tomatillos over here. Would tomatoes work instead or will it taste to different?